Global auto stocks rebounded sharply in the third quarter amid the plodding economic recovery, with retailers turning in their strongest performance in more than a year. Auto-sector values in the July-September period surged across the board, according to the Automotive News/PricewaterhouseCoopers Shareholder Value Index. The index for global automakers rose 20 percent, the global suppliers' index rose 19 percent, and the index for U.S. retailers rose 21 percent. All roughly doubled the gains of U.S. stock market indices. The gains come after a shaky second quarter, during which values in the auto sector fell 6 to 8 percent amid a broad downturn in global markets. The 21 percent jump for U.S. retailers reflects "more availability of credit," said Jeff Zaleski, a PricewaterhouseCoopers partner, in a report detailing the shareholder index. It was the biggest increase for retailers since the second quarter of 2009. The index measures a company's total shareholder return, accounting for share price, dividends and share splits, buybacks or other changes in shareholder equity. It encompasses publicly owned automakers with annual volume of at least 1 million units, public auto-parts suppliers with a minimum of $3 billion in annual sales and Fortune 1000 public auto retail groups with at least half of their unit sales from new vehicles. European automakers led the way with a 35 percent total return in the third quarter, doubling the 18 percent return among Asia's six big automakers. All the European companies beat the 21 percent return for Ford Motor Co., the lone North American automaker included in the study. Italy's Fiat S.p.A.'s returns surged 48 percent, the biggest gain among all automakers. Fiat surprised investors during the quarter by reporting a return to profitability in the previous quarter and hinting that it would bump up its full-year profit outlook. Germany's BMW AG climbed 43 percent, the second-biggest increase globally. Europe's stock markets outperformed U.S. markets during the quarter as concerns over the European region's debt crisis began to ease. Toyota Motor Corp. turned in the weakest performance among automakers, adding only 3 percent. Parts makers are riding the global economic recovery while also reaping the rewards of steep cost cuts from restructuring efforts put in place over the past two years. European suppliers were the third quarter's biggest winners, gaining 37 percent against a 29 percent increase for North American parts makers. Values for Asian suppliers grew 5 percent. The biggest gainers were Valeo SA of France, up 68 percent; Britain's GKN PLC, up 53 percent; TRW Automotive Inc., of suburban Detroit, up 51 percent; Germany's Continental AG, up 49 percent; and Federal-Mogul Corp., of suburban Detroit, up 45 percent. Over the past 12 months, North American suppliers have rewarded investors more handsomely than their counterparts in Europe and Asia. They're up 75 percent on average vs. gains of 44 percent for European parts makers and 10 percent for Asian suppliers. A look further back shows just how far most supplier values fell during the downturn. Of the 37 companies tracked, 26 lost value over the past three years. Still, the suppliers' index dropped 16 percent over those three years, while the automakers' index tumbled 24 percent, pulled down by a 99 percent collapse in General Motors Co.'s return. The data on this page represent the 3rd-quarter update of the Automotive News/PricewaterhouseCoopers Shareholder Value Index. 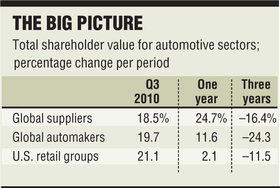 The index reflects total shareholder return, which is calculated separately for automakers, suppliers and retailers. Total shareholder return, considered the best indicator of shareholder value, shows the change in the value of an investment in a period. Each company on the Automotive News/PricewaterhouseCoopers Shareholder Value Index is measured using share price movement, stock splits or buybacks and reinvestment of any cash dividends. The calculation assumes all dividends are reinvested in additional stock. The index average is weighted by market capitalization -- a company's share price multiplied by shares outstanding -- so the performance of companies with larger market caps has a greater impact on the index. All six of the publicly traded U.S. retailers saw shareholder values rise in the third quarter. Lithia Motors Inc.'s 56 percent jump led the pack, as the Medford, Ore., dealership group rebounded from a 38 percent drop, the worst-performing value over the past 12 months. AutoNation Inc. led the retail sector over the 12 months, with a 29 percent gain in value. In addition to easing credit for consumers, the gains by dealership groups reflect "a less competitive marketplace," Zaleski said, the result of thousands of dealership closings over the past year.